There’s a high chance that you visit us on a smartphone, or at least own one. Almost everyone has one today and there’s millions of apps out there. Not all of them are worth the precious space on your phone home screen though. This is the first in a new weekly series of posts that focusses on some great apps for your smartphones, that aren’t necessarily gaming related. While Google Reader is dead, RSS hasn’t died out yet. Most people switched to Feedly or services like Feedbin or Fever to get their RSS fix. There are free basic apps that try and get the job done, but when it comes to iOS and Android, two apps in particular make the experience an absolute joy. This is without a doubt the best looking app on the platform. It looks great and works amazingly well. Press supports both Android phones and tablets and even utilizes the newer Android 4.4 and later features like immersive mode. It has widgets and supports background refresh. Press has a light and dark theme that look phenomenal. Press is an app that deserves to be on your Android device. It is available for $2.99/£1.93 on Google Play and is worth a lot more than the asking price. Before you raise your pitchforks at me for not mentioning the popular Reeder for iPhone, hear me out. Unread for iPhone has the best reading experience on the platform. The fonts are great and it has some really good themes. The app is completely gesture driven and has great one handed use throughout. Unread is an app for people who actually want to read their RSS articles and not glance through headlines (even though you can obviously do that). 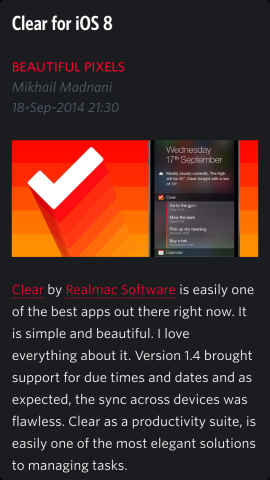 Unread makes getting through your feeds, simple and enjoyable. Unread for iPhone is available on the App Store for $4.99/£2.99. Most people use the stock calendar app on iPhone, and while it may get the job done for some, the third party apps on iPhone are mostly all better. Fantastical 2 for iPhone is my pick for the best calendar app out there. It has a slick interface and its natural language processing sets it apart from the crowd. Fantastical can replace both the calendar app and reminders app on your iPhone or iPad. It even supports birthdays and lets you wish people in your contacts list via messages, phone, twitter, facebook from within the app. Entering events is easier than any other app. It accepts full sentences like “Dinner with Adam tomorrow from 9-to-10 at the Hyatt to discuss future site plans” and puts the correct keywords into the relevant fields. I love how it also lets you work with reminders. Fantastical 2 can essentially replace the built in reminders and calendar apps. It is available for $4.99/£2.99 on the App Store. Ever since Android 4.1 introduced expandable notifications, apps have started taking advantage of the rich notification system to save you time while getting things done. Notif is a very simple app that lets you add custom notifications to the notifications shade on your Android 4.1+ device. It can range from images to expandable todo lists. Notif Pro even has support for reminders, Google Now voice search, and Android Beam. Notif is available on Google Play for free and the Pro version costs just $0.99. I love listening to podcasts. I try and listen to one before sleeping each night while playing Hearthstone. There are a lot of nice podcast apps on iOS and Android, but my favourite app is Pocket Casts. Pocket Casts is not only designed really well, but it also works brilliantly across multiple platforms. Many apps usually restrict sync to one mobile platform but Shifty Jelly do great work on both platforms and let you sync across. Pocket Casts has background downloading, custom playlist support, push notifications for podcasts, and more. On Android it even has an interactive player in the notification shade and expandable notifications. Pocket Casts is available for $3.99 on Android over at Google Play and $3.99 on iOS as a universal app on the App Store. 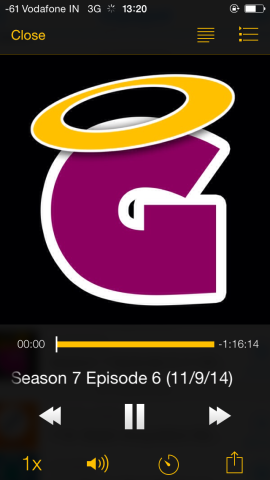 You can test out this app by subscribing to our podcast on iTunes. Mikhail is what we’d consider an expert on mobile apps, but (like him) we’re always happy to hear what you think. Use an app you think is better for the given task? Sound off in the comments below.